Orlando, FL – Interventions Unlimited (IU), a leading provider of high quality Applied Behavior Analysis (ABA) Therapy for individuals with Autism and other learning and behavioral difficulties, has been named a 2016 Florida Companies to Watch. IU is among 50 statewide companies expected to see significant growth over the next several years and was selected from more than 500 nominees for Florida Companies to WatchSM, a statewide program managed by economic development group GrowFL, in association with the Edward Lowe Foundation. Interventions Unlimited earned its recognition as a Florida Companies to Watch based upon the competitive advantage it has established through the superior quality of care to gives to its clients and families; the innovation and entrepreneurial style it brings to its work; and its extensive and meaningful involvement in the Central Florida community. It is these and other factors that distinguished IU as a company with an ever increasing ability to grow and made it one of the 50 Florida Companies to Watch award winners. “These stand-out companies are all led by entrepreneurs, and have demonstrated their capacity and intent to grow,” said Dr. Tom O’Neal, executive director of the Florida Economic Gardening Institute and associate vice president for the University of Central Florida’s Office of Research and Commercialization. “They also all have critical intellectual property or a niche position that gives them a competitive edge in their markets,” he said. “This is a strong group of companies that deserve this special recognition given annually to the state's top second stage companies,” said Dr. O’Neal. Second-stage companies are defined as those with six to 150 full-time employees and between $750,000 and $100 million in annual revenue. There are many programs and incubators promoting start-up businesses; GrowFL is the only Florida program that focuses exclusively on second-stage companies. The 50 companies named the 2016 Florida Companies to Watch generated a total of more than $1.1 billion in revenue and added nearly 1,200 employees between 2012 and 2015. Together, the companies project a 30 percent increase in revenue and 33 percent increase in job growth in 2016. For more information, visit growfl.com/flctw16. Interventions Unlimited and Alpine Academy were very grateful that we could be part of the Blue Horizon event hosted by JetBlue and Autism Speaks. 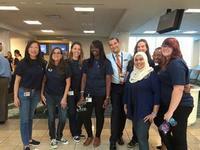 Our Director, Jing Zhou gave a brief training to the JetBlue employees and volunteers prior to families arriving at the gate. We are so pround of our team. FL Trep is a part of the i4 Business magazine, a premiere business magazine in the metro Orlando community. Click here to check out the online version. 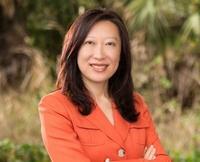 Jing Zhou, Director of Alpine Academy and President of Interventions Unlimited, Inc. has been named the State of Florida Woman-Owned Small Business Person of the Year. Wilfredo J. Gonzalez, the Small Business Administration’s (SBA’s) North Florida District Director, made the announcement at the 2014 Small Business Awards Luncheon held on May 20th in Orlando. “This award is for all the children and parents who inspire us every day, as well as all of our dedicated therapists and staff, and all the wonderful people who have contributed to our success,” said Zhou. Jing's award acceptance speech on Youtube. Annually the AACC recognizes outstanding leadership, initiative, contribution, and positive impact to our Central Florida community. Jing Zhou's record of innovation, her dedication to the special needs community, and business success serves as a role model to inspire other entrepreneurs nationwide. 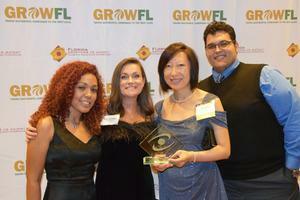 Jing is grateful to the Asian American Chamber of Commerce of Central Florida for their recognition!! Congratulations, Jing! We are very proud and celebrate her award! Interventions Unlimited was awarded "Service Provider of the Year" by P.T.P.T. We would love to thank "Putting the Pieces Together" for awarding Interventions Unlimited with the 2014 Service Provider of the Year. Thank you to all the parents of PTPT for being great advocates for our children. Team Alpine Academy and Interventions Unlimited raised over $4600 for Autism Speaks and is a top provider fund raising team. We appreciate all the families and our staff members for joining our team. Your support has raised awareness and funds to help change the lives for all affected by autism. We are the top provider funder raising team for WalkNow for Autism. WAY TO GO TEAM!